Our first van purchase was an incredible life changing experience. We were lucky enough to buy our van for $800AUD with few mechanical issues. After putting on a "new" set of second hand tires (which I highly recommend), and installing a new battery. We were ready to hit the road. 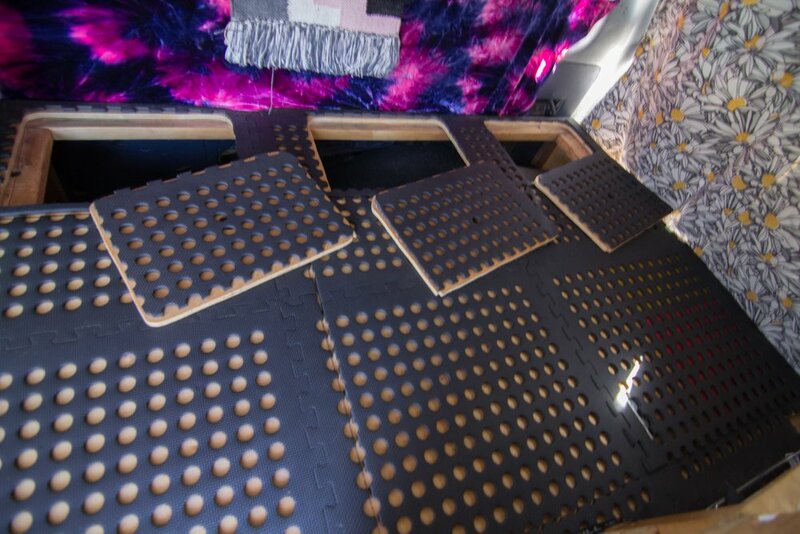 Fortunately for us, the van had a basic bed platform built out and a few trap door type storage doors over the wheel wells. We had added a some high-class K-Mart furniture that happend to fit perfectly. We also built out some food storage with metal drawers for all of our food and added a spice rack to the back of the unit. We also built simple storage boxes on the top of the K-Mart furniture and an additional one on top of the food storage so that items wouldn't fly everywhere during transport. 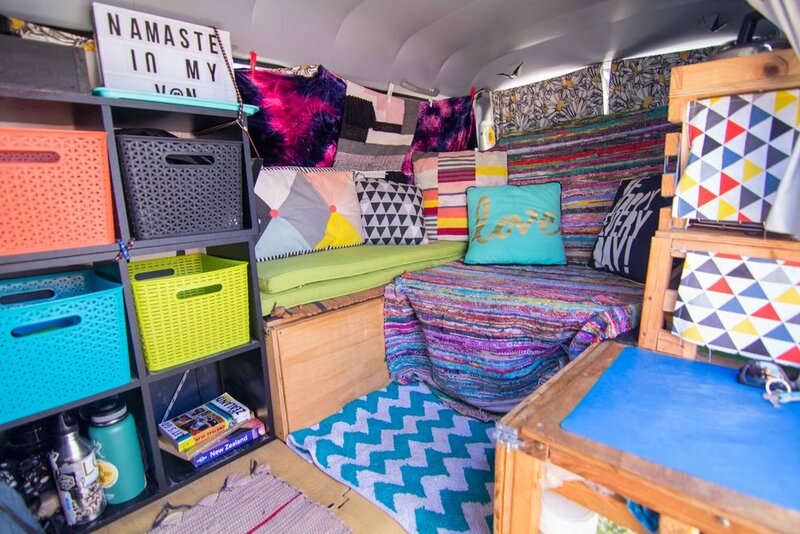 While just a bed was cool at first, we learned that we needed a multi-functioning piece of furniture so that the only option inside the van wasn't just laying down or hunching over. 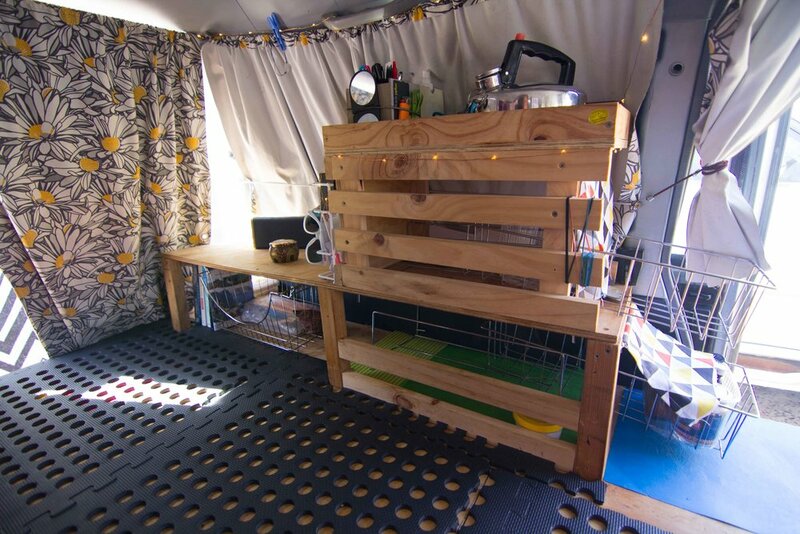 We built a modular bed that could be turned into a couch, as well as, a place to cook and prepare food out the back of the van. Refer to the pictures below. After a few weeks on the road, we realized that we were in extreme need for a better option to keep food cold. Australia is a hot continent. Dealing with melting ice basically everyday, we realized that ice and a cooler wasn't a sustainable option for life on the road. We searched for days high and low we finally found the perfect fridge freezer for the space, a Waeco CF-18. We were able to power the fridge with our auxiliary 75 amp hour deep cycle battery that was powered by a isolator charged the battery, while we drove. We soon discovered that once we would find the perfect surf spot to hang out for a few days that we would not drive the van enough to charge the battery. So, we lost power to the fridge. Our next step was to progress to a solar system. We bought a 120 watt solar panel with a built-in regulator that our sparky friend helped us install the panel to the roof racks and then hard wired it to the battery. Now, we were able to harness the power of the almighty Aussie sun as it charged our battery all day, as well as, still having the ability to charge as we drove to a new destination. After a few months, Damon was set up and vanlife became so enjoyable with cold food, beers, and basically infinite power. We drove Damon over 40,000 kms, roughly 25,000 miles, down the east coast of Australia to Adelaide, and then back up to Sydney where we eventually sold our beloved companion to one of our good friends for the deal of the century. Living out of a van taught us so much that year. We learned to simplify our lives and things we once thought we "needed" became unnecessary. We only bought what we needed to sustain our lives on the road i.e. : food and gas to get around. Once there is no space for unnecessary items, you no longer buy random stuff beacuse you have nowhere to put it and you can no longer justify spending money on it. We were able to work and save more money like we never had in the past. It had been a life changing experience for us. We plan to one day live off the grid in a tiny sustainable home and living in an extremely small space, like a van, has taught us so much and has prepared us more than anything ever could have for living small.